While in South America you can try some of the best chorillana in Chile. Then head over to Uruguay, and follow Anthony Bourdain’s footsteps to get the best parrilla. In Buenos Aires, Argentina, try you'll be able to taste empanadas from a street vendor pushing his bicycle with a laundry basket filled with empanadas. In Cusco, Peru, enjoy chicken soup in San Pedro Market. While in the Andes of Ecuador order cuy! Dig in with these 10 foods to try when visiting South America. You’ll find Chileans eating chorrillana all day. Made of beef steak strips, fried eggs, lots of onions and French fries, chorrillana is usually served in huge portions, large enough for two. Casino Social J Cruz in Valparaiso was the best place for chorrillana in Chile. This comfort food is served throughout the country. You can get it as far south as in Punta Arenas. If you are in the Bellavista area of Santiago, go to The Galindo Restaurant for chorrillana. The word parrilla in Spanish means both ‘barbecue meat’ and ‘steakhouse’. Parrilla is also referred to as asado (barbecue). In Argentina and Uruguay, parrilla or asado is available throughout the country. The parrilla dish usually includes morcilla (blood sausage), chorizo (sausage), asado de tira (short ribs), mollejas (sweetbreads), matambre de credo (pork flank steak), bife de chorizo (sirloin strip steak), chinchulines (intestines), internal organs and entrana (skirt steak). It is served on a metal container with a low flame burner at the bottom. Mercado del Puerto in Montevideo Uruguay came highly recommended by Anthony Bourdain in his “No Reservations” segment on food in Uruguay. On Saturdays, Brazilians hang out with friends and family around their favourite feijoada either watching football (soccer) or enjoying samba or bossa nova. Feijoada is stew made of black beans, smoked pork and pork spareribs. The traditional ones include pigs’ feet, tails and ears. It’s best to eat feijoada with a cold beer. You can get feijoada throughout Brazil, from Sao Paulo, to Florianopolis to Iguazu Falls. Rio de Janeiro is the best city in Brazil to eat at a churrascaria. Churrascarias or rodizios are all-you-can-eat meat restaurants. The waitstaff make their rounds from table to table with large pieces of barbecued meat on metal skewers and a knife. The best cut is the picanha (top sirloin steak). Besides meat, churrascarias normally have bars, all-you-can-eat sushi, pasta and salad. On the table you will be offered fried banana, farina (toasted cassava flour) and onions. If you ask anyone from Peru, “What’s one dish everyone visiting Peru should try?” the answer will most definitely be lomo saltado. This dish is ubiquitous: You can discovered it in Puno, Lake Titicaca, Cusco, Ollantaytambo, Lares, Cuncani, Arequipa, Colca Canyon, Nazca, Pisco, the Ballestas Islands, Huacachina and Lima. From simple huts in villages at 12,000 feet above sea level, to posh restaurants in Miraflores, you'll find lomo saltado. Even the cook during an Andes drive/journey may served lomo saltado one night at the campsite. We can admit, cuy (grilled guinea pig) is often one of those foods travellers hesitated to try in South America. 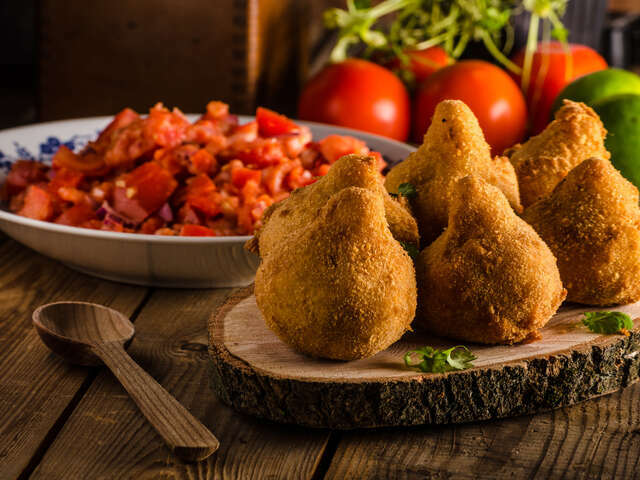 There are so many variations of empanadas in South America - fried or baked, vegetarian, seafood, chicken, beef, cheese or a combination of ingredients. The word empanada means “wrapped in bread.” Empanadas are pastries with fillings wrapped in flour dough. Empanadas are found everywhere in South America. In upscale restaurants, makeshift shacks, supermarkets and in street fairs. Argentinian steak is world-renowned. If you like beef, you must eat it in Argentina, especially dry aged T-bone steaks. What is dry aged beef? Think aged cheese and wine - dry aging improves the taste of the beef. It makes the beef more tender and flavorful. Dry aged beef costs a lot more than normal beef, but in Argentina you can have it at a fraction of the cost as at home. We recommend having dry aged t-bone steak at Elena Restaurant in the Four Seasons Hotel Buenos Aires. Salchipapas are fried hot dogs served with French fries and topped with ketchup and local sauces. It is a popular street food sold throughout Ecuador and Peru. Salchipapas in Ecuador are presented differently from the ones in Peru. To make the dish more presentable, Ecuadorians cut the ends of the hotdogs crosswise before frying. Caldo de Gallina is a popular Peruvian chicken soup. The soup consists of noodles, a tough piece of chicken and one hard-boiled egg. It is usually served with a small bowl of ahi (sauce). A bowl of Caldo de Gallina was just six Peruvian soles (about $1.80). South America is easily accessible from the Canada. There are a variety of ways to explore this amazing continent. Try some of the foods listed here and always remember to practice caution - eat in busy and clean places and drink bottled water.